OverviewSonic Riders stars Sonic and his friends, and their quest to win in the World Grand Prix. Their new rivals are the Babylon Rogues, a mysterious group that has information about the Chaos Emeralds. Sonic Riders is a hoverboard-racing video game spin-off produced by Sega and developed by their second-party, United Game Artists for the Nintendo GameCube, Sony PlayStation 2, Microsoft Xbox and PC. 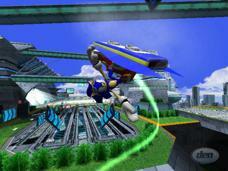 It is the fourth racing game in the Sonic the Hedgehog series, preceded by Sonic Drift, Sonic Drift 2 and Sonic R. This time, the characters ride on vehicles powered by air, called Extreme Gear. 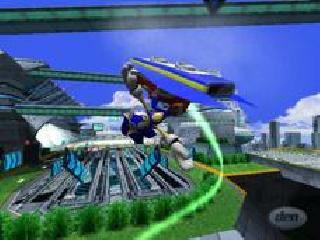 Sonic Riders was revealed by Famitsu on September 7, 2005 prior to 2005's Tokyo Game Show. The game was released to start off the 15th anniversary of the Sonic the Hedgehog series. This game introduces five new playable characters, the Babylon Rogues and the E-10000 series. 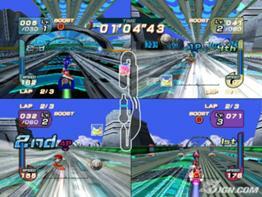 A sequel to Sonic Riders, entitled as Sonic Riders: Zero Gravity, has been released on the Wii and PlayStation 2 systems. A second sequel, entitled Sonic Free Riders, was released on November 4, 2010 for the Xbox 360's hands-free Kinect peripheral. Now you can add videos, screenshots, or other images (cover scans, disc scans, etc.) for Sonic Riders (Australia) (En,Fr,De,Es,It) to Emuparadise. Do it now!